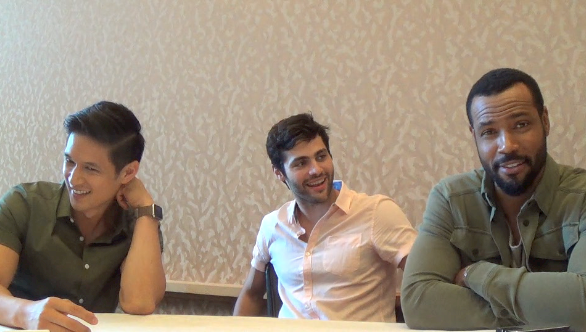 We spoke with Shadowhunters stars Harry Shum Jr., Matthew Daddario, and Isaiah Mustafa at San Diego Comic-Con earlier this month, where they discussed Malec, Luke and Maia’s dynamic, and previewed more of what we can expect. When it comes to relationships on Shadowhunters, there’s none perhaps as hyped than Malec. Magnus and Alec’s relationship is iconic in Cassandra Clare’s books, but we haven’t gotten to see a lot of development with the characters given how early on we are in the show. “We’re seeing the beginning of it,” Daddario said of Malec’s relationship. Both Magnus and Alec have their own unique, and one could say “mess” of a history. But Daddario believes that eventually that’ll unite them. And as Mustafa pointed out, we’re still in the very early stages of Magnus and Alec’s relationship. It wouldn’t feel natural for them to take such significant steps given the small period of time they’ve known each other and been with each other. Some things are worth waiting for. And Malec is definitely one of them.